I love having greenery in my home, there is something so refreshing about greenery. I will admit that I do not have much of a green thumb so I am always on the lookout for authentic looking plants and decor without the hassle of keeping a real plant alive. 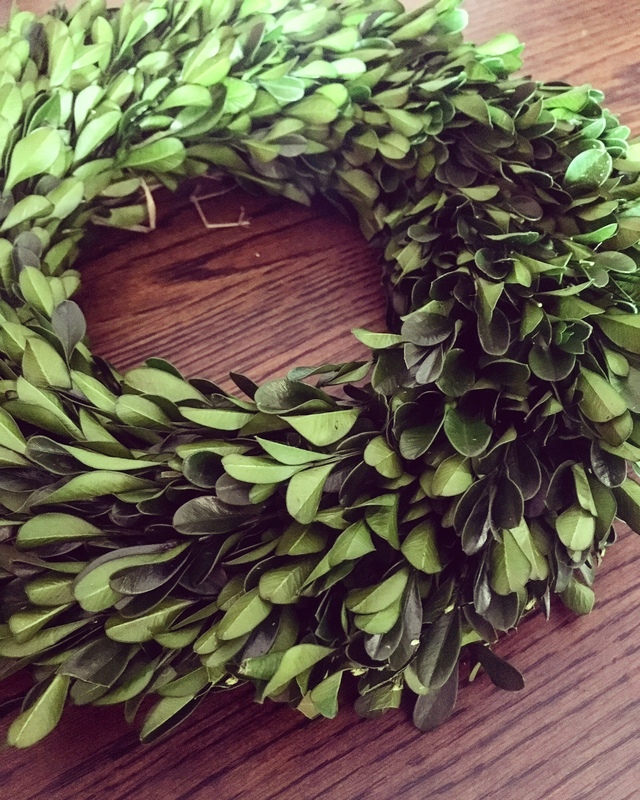 One greenery item that I absolutely adore is the preserved boxwood leaves, especially as wreaths. They look good all the time and they are fun to use as statement decor pieces. 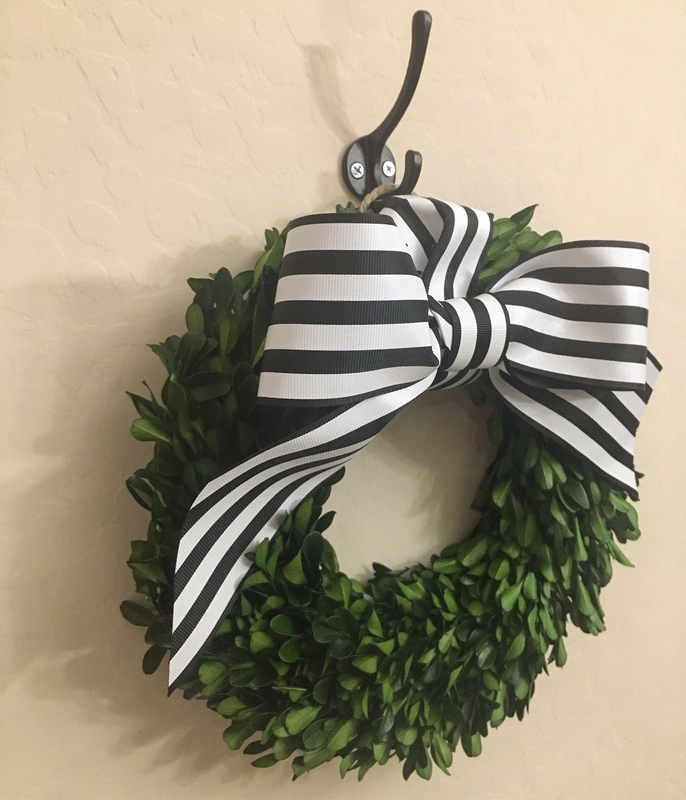 This DIY project came to life when I fell in love with the 11″ Smith & Hawken™ preserved boxwood leaves wreath at Target because it is fabulous! The color is a rich green, it comes with a woven hanger and it looks so real! It inspired me to get creative and do a little DIYing! I have been wanting to add a fun wreath to my eat-in breakfast nook in my kitchen and this wreath was perfect to work with. 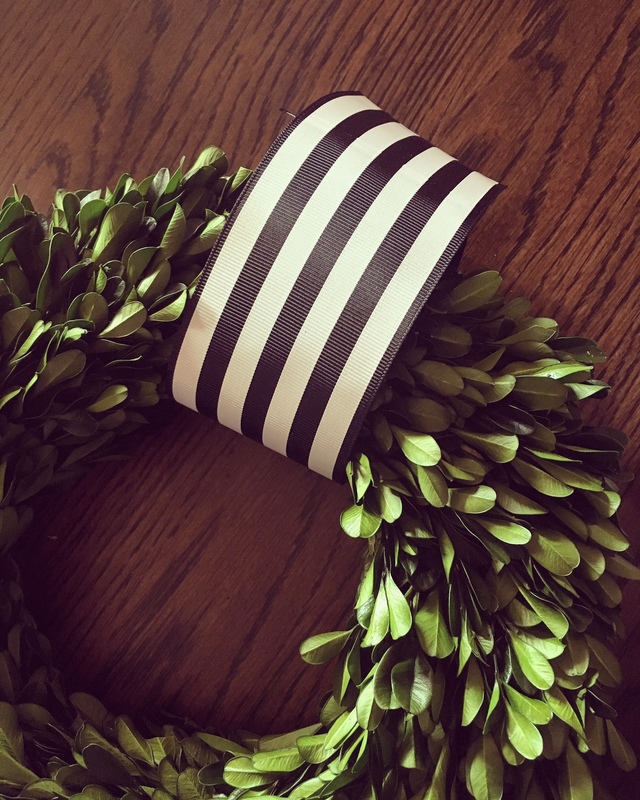 So I picked up my wreath and ran over to Michaels to select a roll of ribbon… and got crafty. 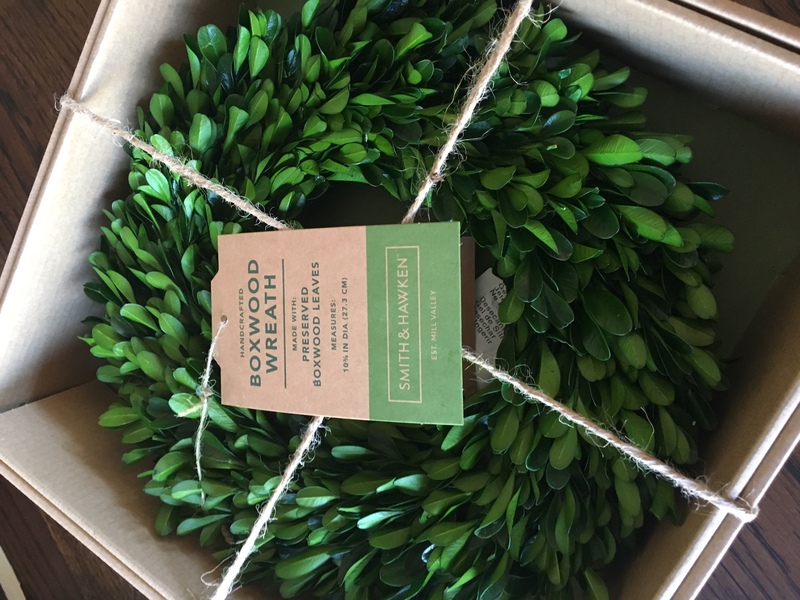 1.Boxwood Wreath. 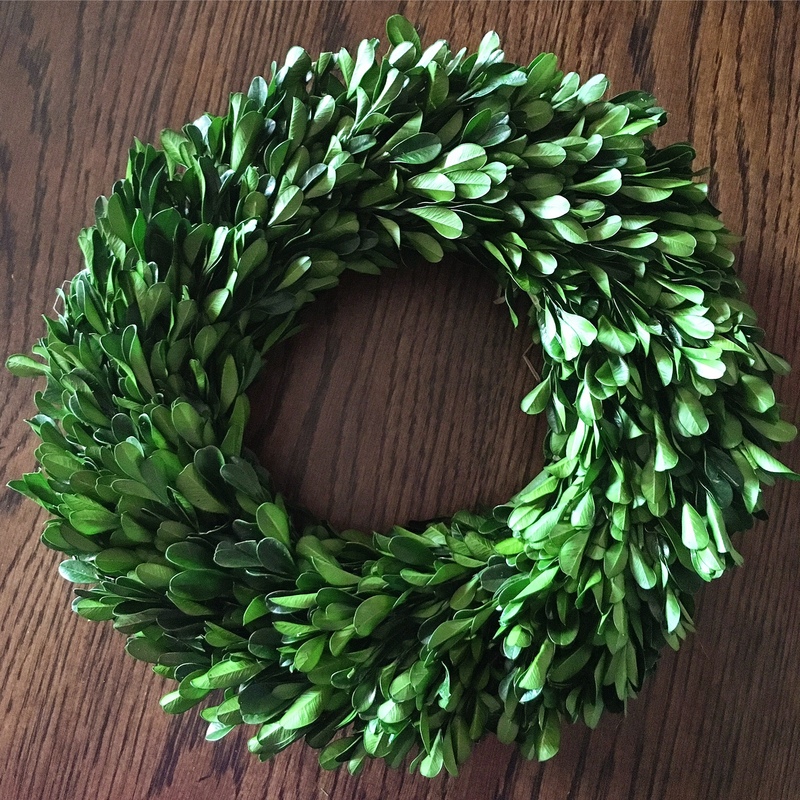 My favorite affordable and authentic looking wreaths can be found at Target in 2 sizes: 11″ and 21.25″. 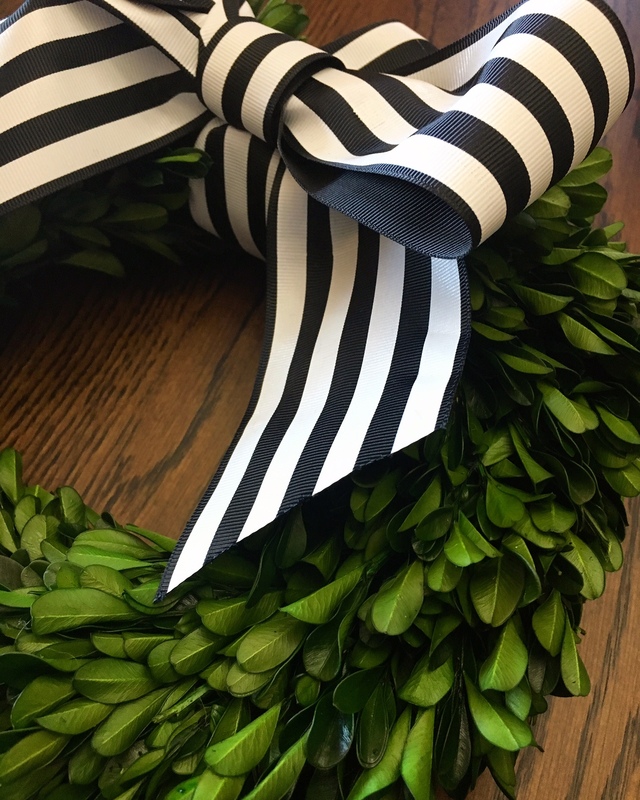 I also love this square 16.5″ wreath option that might be nice for an outdoor decoration. Or feel free to be extra crafty and make your own. 2.Ribbon of your choice. I selected this chunky 2.5″ ribbon, but you can use any size that you prefer, or feel free to mix it up with a few different ribbons or twines. 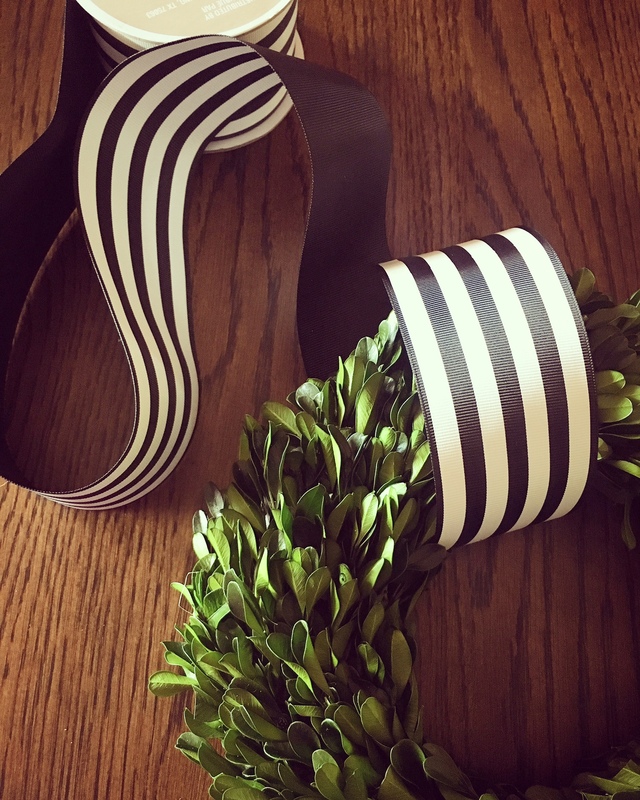 I found this roll of black and white striped ribbon at Michaels. 3.Hook or knob of your choice. 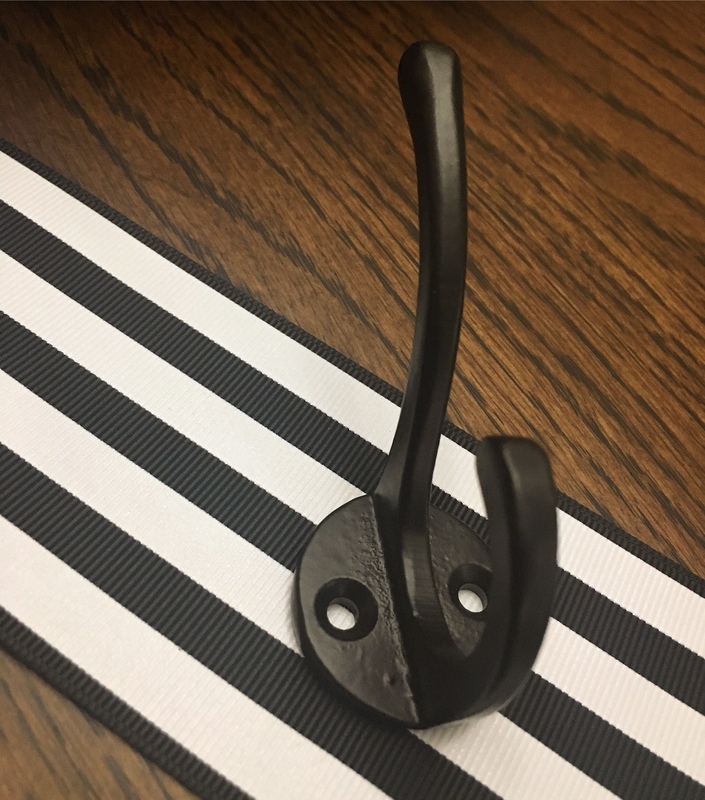 I found this black classic metal double hook at Hobby Lobby (you will also need screws and any other items to hang the hook on the wall). How to create your hanging wreath! Plug in your glue gun and get it warmed up. 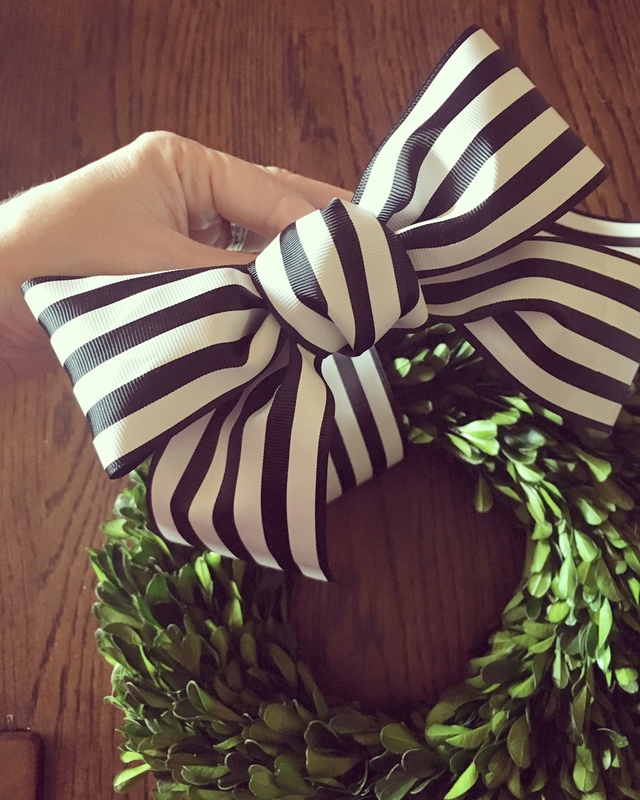 Then start by wrapping your ribbon around your wreath creating a loop of ribbon around the top. 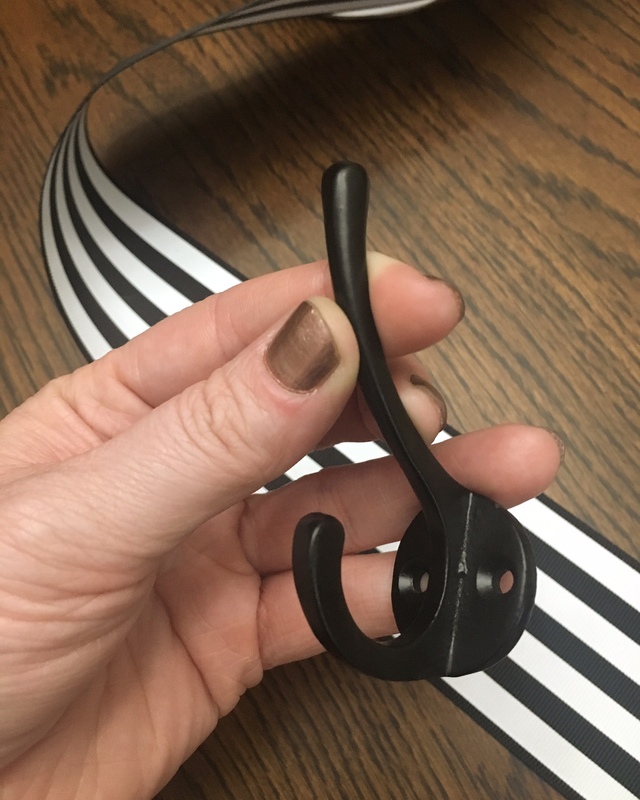 If your wreath comes with a loop hook for hanging, like this wreath does, tuck your ribbon under it so that you can use that loop to hang it when you are done. 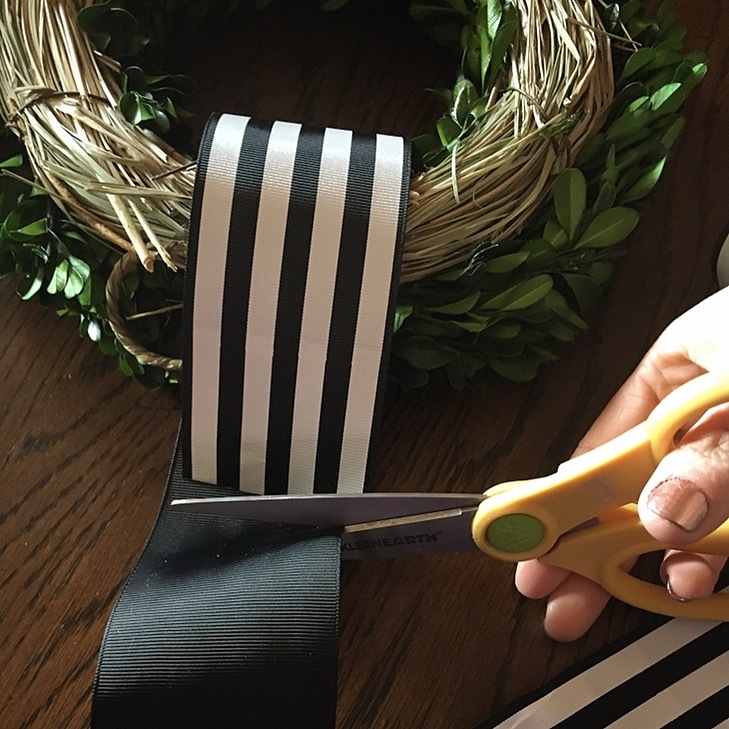 Cut the ribbon to the desired size and glue it together and onto the wreath. Time to create a bow. 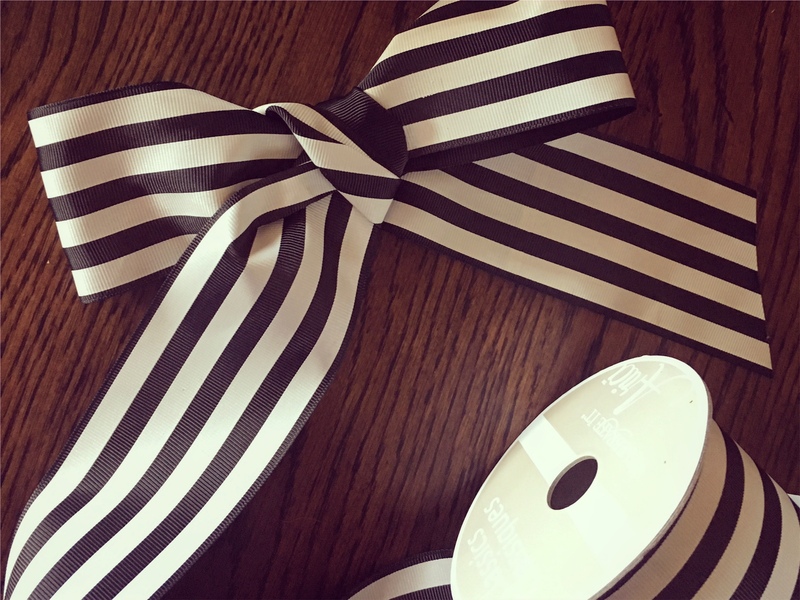 Create a bow at the desired size you prefer. 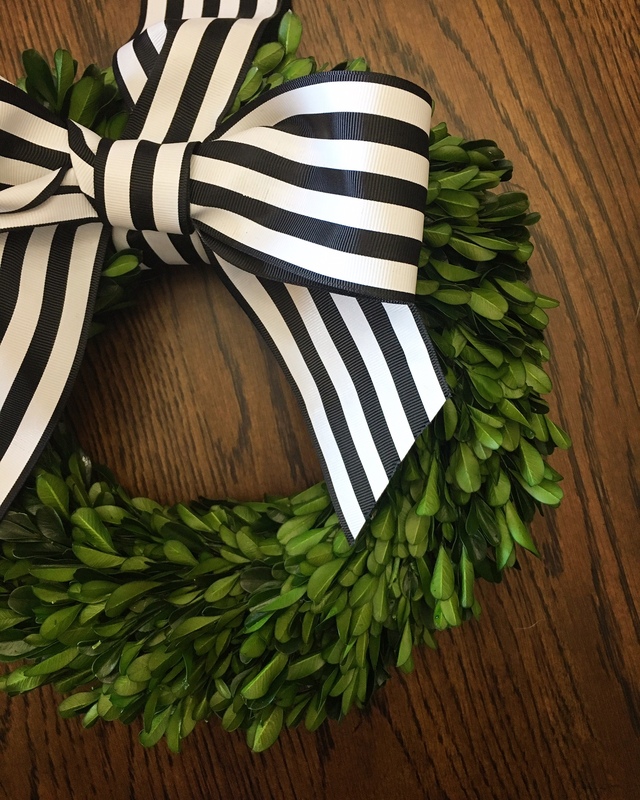 My bow measures 8″ across which is perfect for this 11″ wreath, but be sure to adjust the bow to your wreath size. 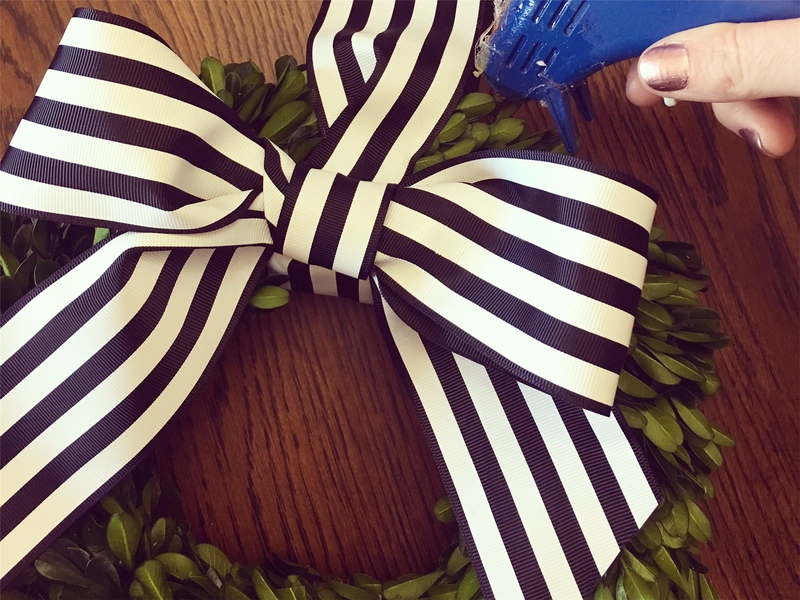 Once you have your bow ready, hot glue it onto the ribbon loop that is already attached to your wreath. 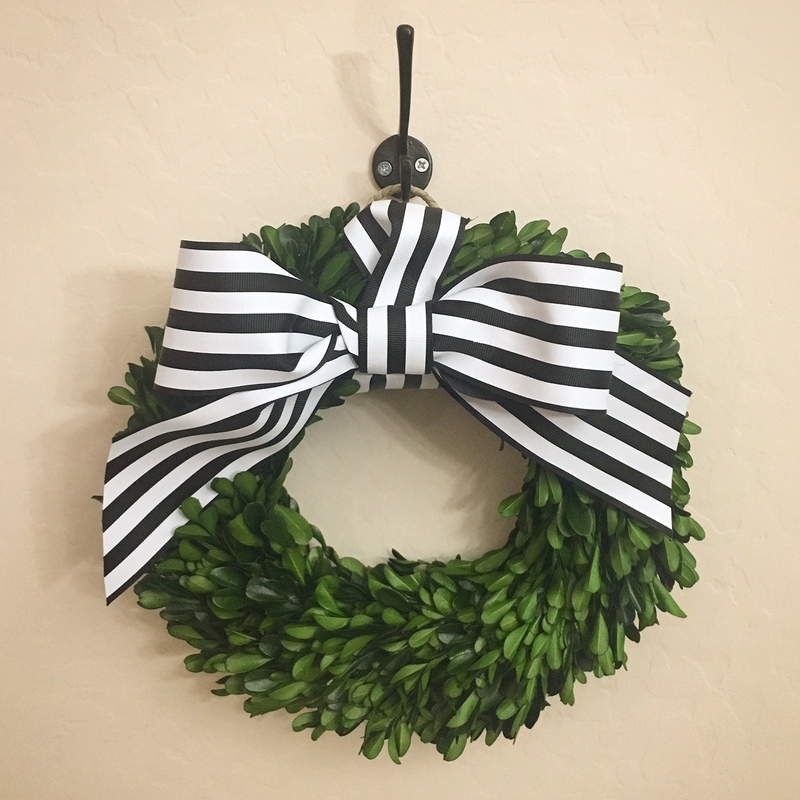 If your wreath doesn’t come with a built-in hook, feel free to add a twine loop to later hook it on the wall with, or get creative with a loop of your choice. See a picture of the loop below, for an example. Your wreath is now ready to be hung up on the wall. 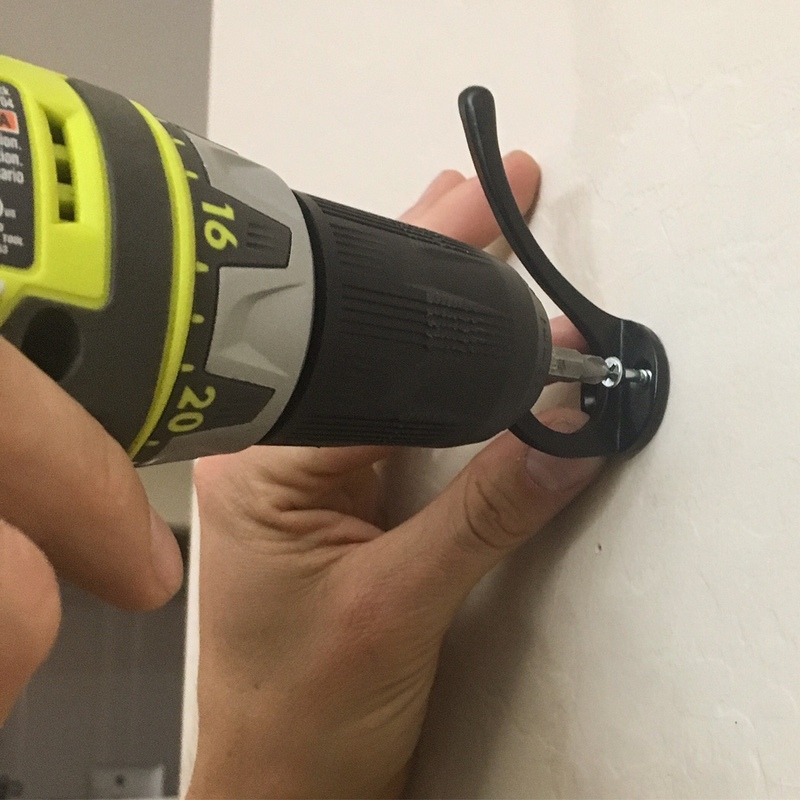 Grab your knob or hook and screw or nail it into your preferred spot. 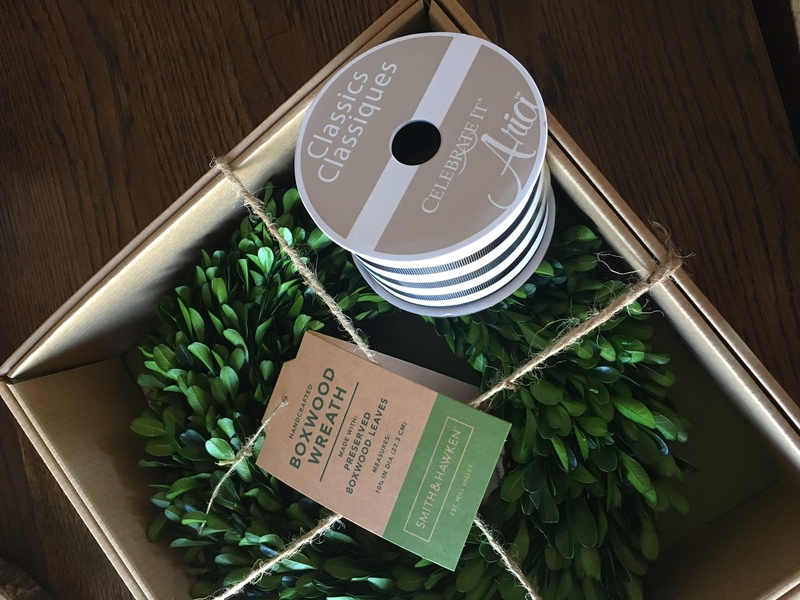 And just like that you have a year round, decorative greenery boxwood wreath to enjoy! I love this wreath! It perfectly finishes off my kitchen space! I hope you have been inspired by this tutorial! Have fun with greenery and add life to your home! If you liked this DIY post you will enjoy this home decor post as well! this wreath is gorgeous! i need one for my front door! Totally making these for the new house! You will love them Stephanie! This wreath is so pretty! Once upon a time I used to make wreaths! I need to start again! Thank you Jaclyn! They are a fun DIY craft! Thank you Suzette – Great idea!